Chef Carlos Garcia of Latin America's 50 Best Restaurants brings his flavors to Miami. What to expect: The restaurant, housed inside the Jade at Brickell Bay, is welcoming. The first thing you’ll notice is the open kitchen and the large wrap-around counter that seats twenty-five. It makes sense, as the restaurant was designed by Alejandro Barrios Carrero, an architect and interior designer who won the James Beard Award for “Outstanding Restaurant Design” in 2013. 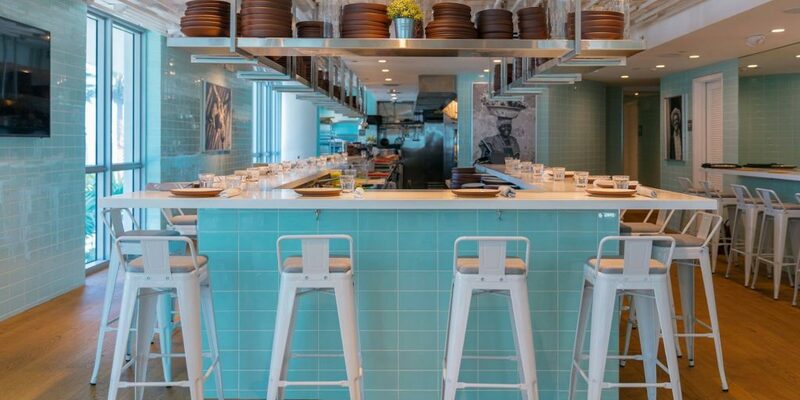 The space is lively and bright with white wooden floors and walls lined with aqua colored tiles. The interior is almost as impressive as the chef, Carlos Garcia, who trained in groundbreaking restaurants including El Celler de Can Roca and the iconic El Bulli. His restaurant in Caracas, Alto, made the list of Latin America’s 50 Best Restaurants for several years in a row. Carlos and his team have created an inviting, interactive experience for diners looking to taste his contemporary Venezuelan cuisine. The Menu: The menu is primarily Latin, with influences from cuisines around the world. The starters, ranging from tiraditos to lamb tartare, are meant to be shared. Rice and pasta options feature seafood and fresh vegetables. There is also an impressive variety of fresh fish and meat selections. What to order: We started our meal with one of Obra’s signature cocktails: the Non-Traditional Negroni. Made with Mezcal, antica, Campari, carrot, and blood orange, this drink had a seductive smoky flavor that left us wanting more. Order the Octopus, Shrimp, Scallop, and Mussel on Corn Fritter – a generous sampling of seafood drizzled with a delicious Amarillo sauce and scallions, served atop a crunchy corn fritter base. Another must-try is the Rack of Lamb, succulent and well-seasoned, with a yummy tamarind sauce and mushrooms in escabeche. How to score a table: We recommend making a reservation, but Obra definitely welcomes walk-ins. This is a great spot for a business lunch or after work (or play) drinks and dinner!